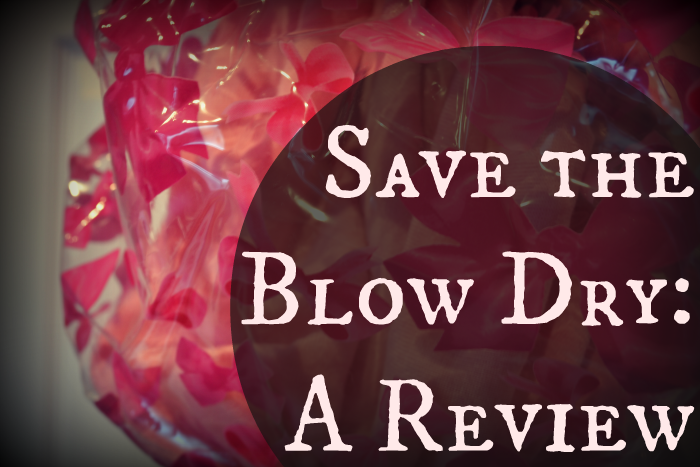 A little while ago I was sent a 'Save the Blow Dry' for review after specifically requesting this item on Bloggers Required. Now, I've been growing my hair for a little while, and it's the longest it's ever been (I am quite aware it's not that long, but it's a big thing for me ok), which although all well and good, I'm starting to learn just how much time it takes to blow dry your hair every morning. This morning I decided to put my shower cap to good use and give it a spin. Bleary eyed and extremely tired I got up out of my bed, stumbled to the bathroom, stuck my shower cap on, tucked my hair up inside and then crossed my fingers and hoped for the best. Fortunately I was not disappointed, my hair come out all still amazingly dry and looking just as it had done before I stepped into the shower. I will admit that overnight my hair had lost a bit of of it shape anyway, and was not longer nicely blown under at the ends so I can't really comment on if the shower cap keeps a perfect style, but I can say that whatever my hair was like before it went under the shower cap it was like after I look it off. As I have a fringe, this was the one thing I thought may go a bit array but no, it was still fine and dandy! All of my hair very easily fitted into the cap and the elasticated band made sure that no hair got loose and got wet. The size is perfect for whatever hair type you have or I should imagine whatever head size you have too, it even fitted my teeny tiny little head, which is a miracle! My hair didn't feel greasy or lank when it come out either which is kind of what I was expecting, but the internal lining did just as it said on the packaging and keep my cap moisture free. Finally, I love the style of this shower cap, the print is so cute and to me has something of a soap and glory feel about it, very classy, very classy indeed (well, as classy as a shower cap is ever gonna get anyway). Oh and it's reversible so you can pop some conditioner on your hair, turn the cap inside out so the cloth lining doesn't get pretty minging and just carry on about your business, happy days! Overall I am so so happy with this product, I can now have just that little bit extra time in the mornings, safe in the knowledge I can jump in and out of the shower and then not have to spend that extra 20 minutes drying my hair. With all this extra time on my hands I don't know what I'm gonna do, maybe I'll be a bit of a daredevil and have some extra time in bed, wow, crazy huh! 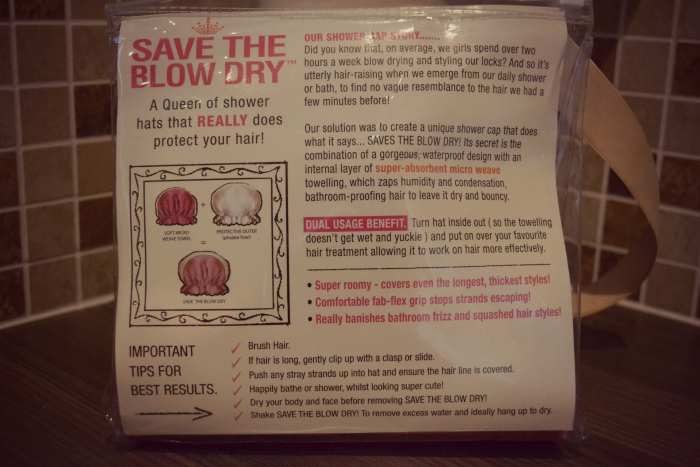 Let me know if you've been trying this little cap out of what your experiences with hair washing/drying are. Do you wash your hair every morning? I'm looking to see if I have been in the minority here! Great review will want to try. In regards to the inside out leave it on for deep conditioning, try it with Lee Staffords for hair that never grows past a certain length. I got two pots in Boots on my points and use it inbetween shampoo and conditioning. 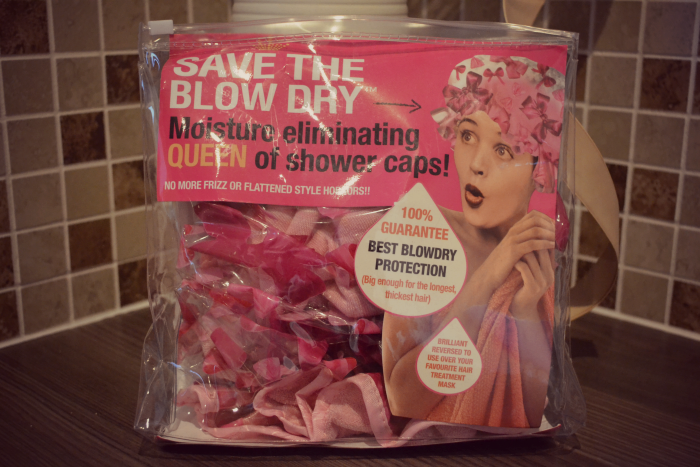 It is amazing just like that so can't imagine what it would be like with your shower cap.